I’m a proud mixed farmer from Moose Jaw SK. 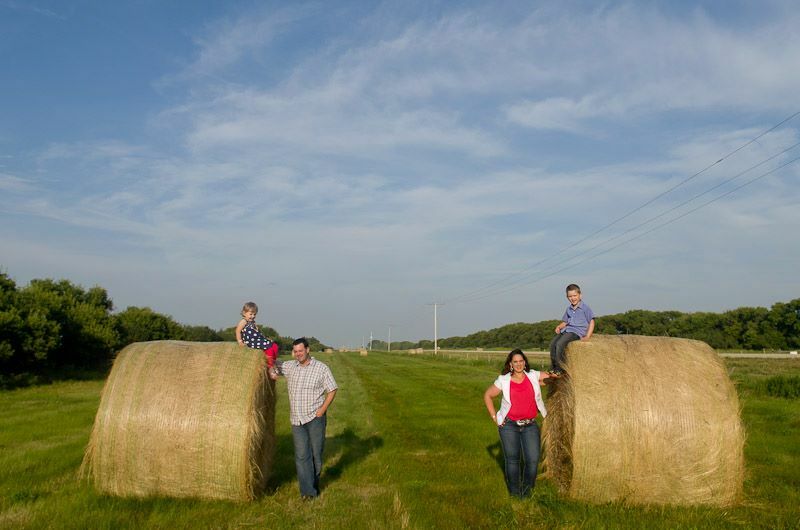 We have a family farm operation that grows cattle, grain and hay. I’ve been a farmer all my life. Growing up on a dairy farm in BC with 5 brothers and a sister gave me a strong a start. I moved to the prairies for Agriculture college at the University of Saskatchewan and fell in love with 3 things – the prairie sky, agriculture and my husband. My husband and I moved back to his family farm and our kids are the fourth generation raised on the farm. We have a true mixed farming operation with 250 purebred cows, 4100 acres of grain land, pasture land and hay land under irrigation. I will do my best to share my story of farming and answer any questions you have. I have a Bachelor’s of Science in Agriculture in Animals Science, a Master’s of Science in Ruminant (Cattle) Nutrition and Microbiology and am a member of the Saskatchewan Institute of Agrologists. I have over ten years of experience working in the livestock industry. I was a part owner of my family’s dairy farm until 2005. My brothers are all dairy farming in B.C. My husband and I have been involved in the farm Moose Jaw since 2009. Well, he’s been part of the farm since forever, his uncle gave each of the kids a cow when they were born to build up their own herd. My kids now too have received a cow when they were born to build up their own herd. In terms of food and fitness, have a certified Personal Trainer training as well as a Nutrition and Wellness Specialist. I have been on various ends of the fitness scale but know that I feel best when I am active and eating well. Keeping at all in balance is a challenge for me as it is for many people. I’m happy to share my fitness and nutrition journey with you. We have 250 purebred cows (Charolais and Red Angus). We raised the females to produce calves and we sell the bulls to other farmers for them to breed there mama cows to. Our cows graze pasture (grass) land through the summer and in the winter we feed them stock piled fermented grass (silage) and a bit of grain to keep them healthy and happy. I started beekeeping in 2015 with some previous experience from summer jobs and a uncle thay raises bees. It’s a wild ride with lots to learn. We ade slowly growing the bee operation up and sell our honey locally through gift shops and the farmer’s market. We grow a variety of grains and oilseeds in a rotation. We usually grow a mix of barley, wheat, canola, and flax. We are conventional farmers and use the best science to help grow food to feed the world. Did you know that Canada produces over half the Canola in the world?? Amazing! We have a lot of land that is not suitable for grain production. On that land we either graze our cows on pasture or grow grasses to harvest for cattle to eat during the winter. We have a very unique system that uses effluent city water to irrigate our crops. It’s a win-win for the city and us.